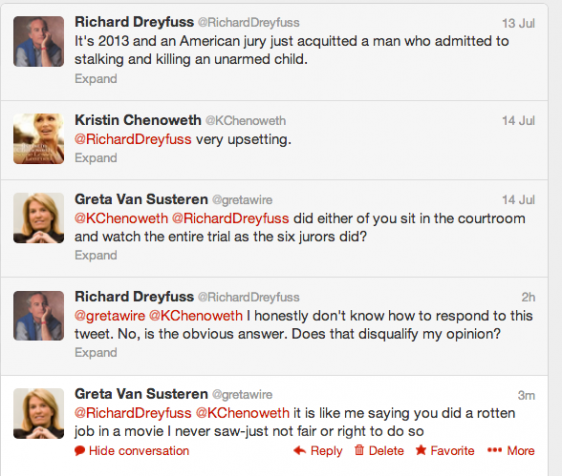 Below is my twitter conversation with actor Richard Dreyfuss. As you all know, I defend the jury system, and I defend jurors who are 'drafted,' listen to hand picked evidence by the lawyers, instructed on the precise law to apply by the judge and then who collectively deliberate. Unlike everyone else -- including me -- the jurors were actually in the courtroom hearing 100 percent of the evidence. Of course Dreyfuss and everyone else is entitled to an opinion. See his tweets below. I also support the First Amendment which is so broad that it even protects ignorance. As everyone will recall, many thousands got mad at me and some even threatened me in 1995 when I supported the jury in the OJ Simpson case. That was a case, as you all remember, where an African-American man was acquitted of murdering his white ex-wife. Some people were so angry about the Simpson verdict that they did not listen to me -- they incorrectly said I said Simpson was innocent (I did not and he was not). A jury is never asked the question of innocence, it is merely asked whether the prosecution has proven a case beyond a reasonable doubt. If there is even one reason to have doubt in a criminal case (two explanations for an event? dirty cops? someone else with a motive to kill? ), the law requires a verdict of not guilty. It is not an option, it is a requirement. More lawyers and citizens should be standing up for the jury system. Destroying the jury system is dangerous. Who do you want to decide a case? those who actually heard ALL the evidence and considered it or those who simply picked sides? Trials are not about picking sides. How many people do you know who duck jury service? Or are you willing to participate? And if you have served on a jury where the verdict is unanimous (and not hung), you know what I mean about the jury system. You agree with me. P.S. : Of course the jury system is not perfect... but do you have a better idea? Mob justice sure is not fair but if you have a better idea, let me know. And in those instances of imperfection, I suggest you look not at the juries but the so called experts -- the Judge and the lawyers.